I’m often surprised by the requests that come through to my inbox, but this one simply delighted me. A lovely client wanted to propose to his girlfriend with a bespoke chocolate engagement ring, within a bespoke chocolate ring box. He sent me her ring size and some other specifications, and I suggested we use an edible diamond to give it that essential sparkle. 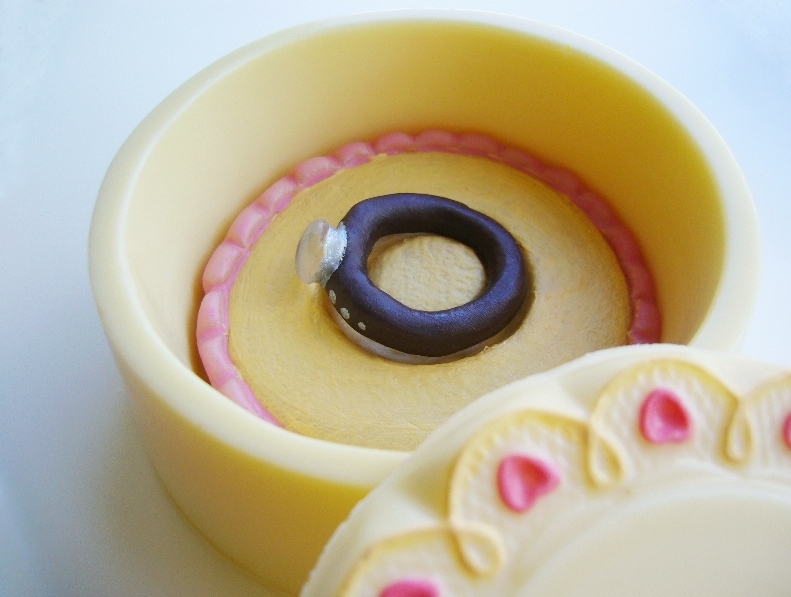 The ring is made from dark chocolate, nestled on top of a marzipan cushion. 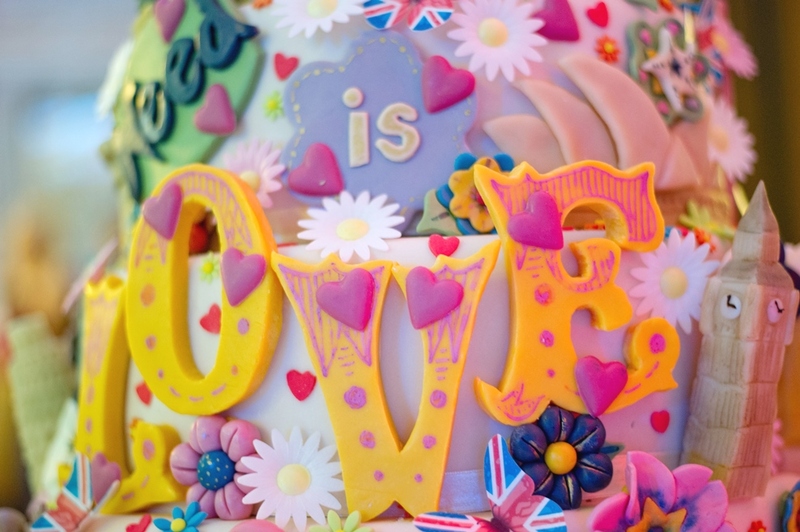 It sits within a white chocolate box that is adorned with delicate pink hearts and gold detailing. It’s really something special to be a small part of the personal moments in people’s lives. It’s one of the most rewarding parts of my job. The best part is that she said yes (how could you refuse a chocolate ring?)! 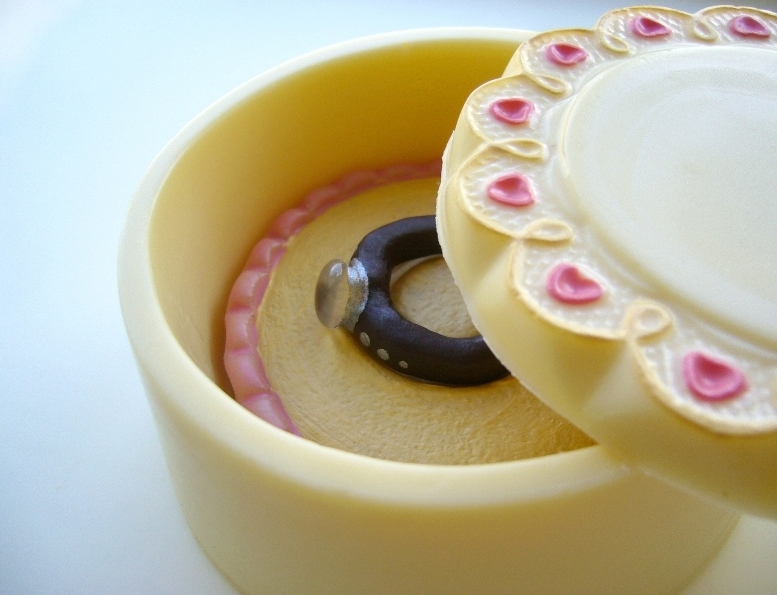 First of all thank you very much again for making this beautiful chocolate ring and ring box! My fiancé absolutely loves it! Everyone we’ve shown photos of the ring makes compliments on how amazing it looks. Thank you very, very much!! If you’d like to discuss your own bespoke chocolate piece, please get in touch. We have been busy in the kitchen lately, squeezing our creative juices to bring you a whole slew of new chocolate flavours. Mixing, blending, whisking, zesting, testing and tasting our way through many recipes to bring you this ultimate collection for Spring/Summer 2015. It would be my pleasure to introduce them to you. Draped in dark chocolate and decorated with a wave, this fudge is made with deep, dark muscovado sugar and real vanilla beans. It’s forgivingly soft but has a little grit for you to get your teeth into. Dark chocolate ganache infused with premium jasmine tea, and dipped in dark chocolate. A pale green swirl on the top finishes the piece. 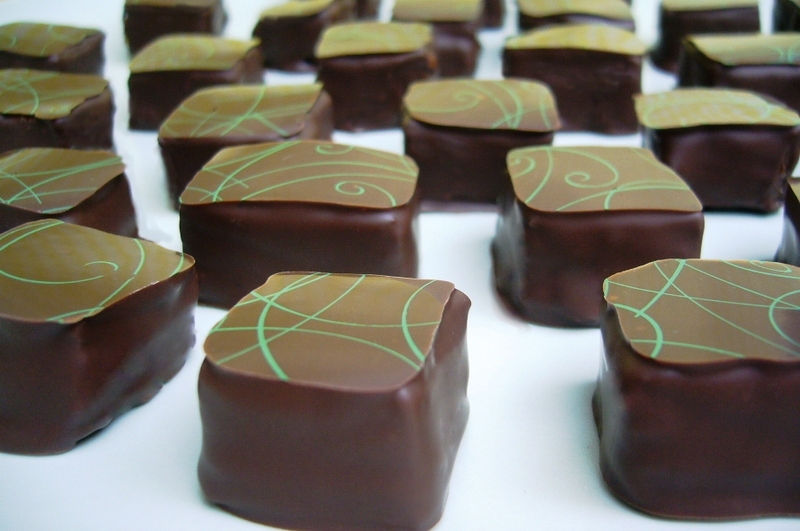 A dark ganache infused with the fresh, bright flavour of lemongrass. It is dipped in dark chocolate and decorated with yellow cocoa butter speckles. This ganache is something special – made using caramelised white chocolate and white shiro miso, it brings a little ‘umami’ to the collection. It’s salty and sweet and caramelly all at once. 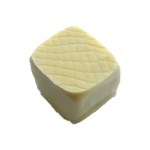 It’s dipped in a not-very-sweet white chocolate and decorated with a snakeskin pattern lightly brushed with golden lustre. 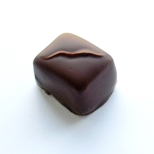 This ganache is made from dark chocolate and our very own homemade ruby grapefruit marmalade. There are tiny slivers of peel hidden inside for texture variation. 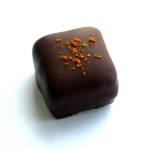 It is dipped by hand in dark Madagascan chocolate and decorated with orange zest crumbs. Doubly crunchy, this peanut praline benefits from pieces of roasted peanut and crispy feuilletine wafers. It is enrobed in milk chocolate and garnished with Maldon sea salt for good measure. You can get your hands on a box containing these very limited edition chocolates here. Enjoy! This is all at once simple, quick and delicious. Perfect to whip up on a lazy Sunday morning. 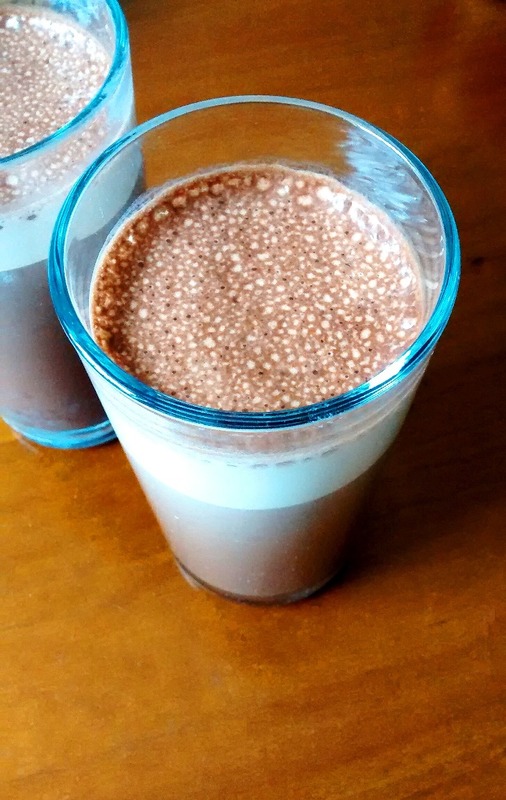 Whizz all ingredients with a hand blender. Part of the beauty of this recipe is that it’s so easy to adapt to your taste. Add a sprinkle of cinnamon if you like, replace some of the sugar for homemade cardamom syrup, add a scoop of peanut butter ice cream, use whatever kind of milk you like (dairy, coconut, almond, soya)… and it only takes a couple of minutes. The important question of whether white chocolate is really chocolate becomes a little redundant here, as you’ll be so busy eating this by the spoonful you won’t care. You’ll be pleased to hear that making this heavenly caramelised treat is really very easy to do yourself. All you need is some good quality white chocolate, a baking pan, an oven and a spatula. Pre-heat your oven to 125°C. Place as much chocolate as you want to caramelise on the baking sheet, chopping it into chunks if it’s not already in button-sized pieces, and place in the oven. Every ten to fifteen minutes, give the chocolate a stir with your spatula, making sure to move it all around to prevent scorching the edges and to ensure even caramelisation. It may be a bit solid and grainy, but coax it with your spatula until it becomes smoother and spreadable. You may find it browning on the bottom more than the top. About an hour or maybe 90 minutes later, you should have something gorgeous-looking. You are causing the delicious Maillard reaction to occur between the milk and the sugar within the chocolate, resulting in caramelisation. You can take it as dark as you want – the longer you leave it, the more caramelised it will become (up to a point… use your common sense people!). If you like, stir in some fine sea salt to balance the sweetness and accentuate that caramel flavour. I defy you to resist eating it with just a spoon. However, if you have such ungodly willpower, there are a thousand and one uses for caramelised white chocolate. 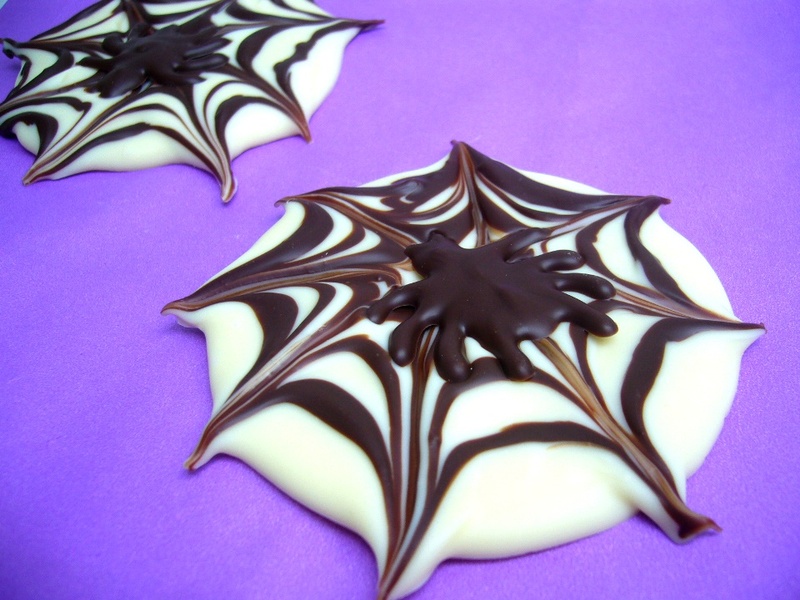 It is great made into a ganache (by mixing it with cream), which can be used for truffles or to cover a cake. 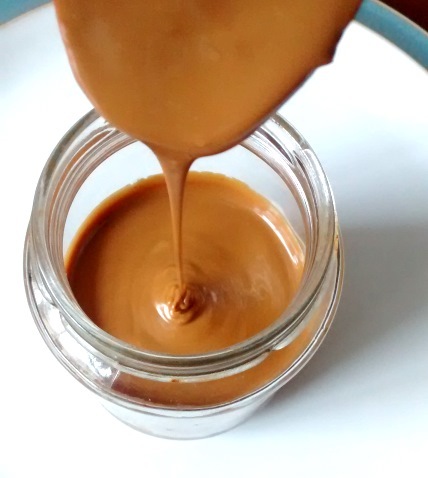 You can use it as a filling for sandwich biscuits or cookies, incorporate it into a buttercream, drizzle it on ice cream or poached fruit, ice buns or eclairs with it, make it into a caramel sauce… the options are almost endless. I think I’m going to use mine to make cornflake crispies. Nothing like a bit of sweet caramel and crunch. It’s not every day you hear those two words strung together. Chocolate. Aubergine. Chocolate aubergine. But in this case, it’s entirely accurate. 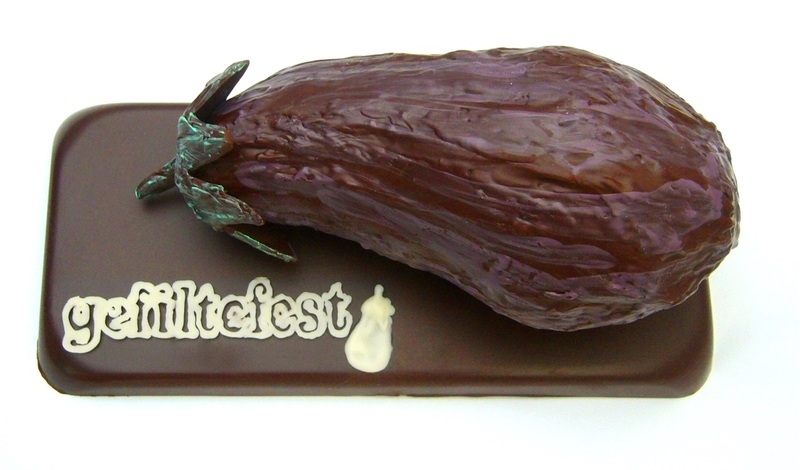 I was commissioned to produce a chocolate sculpture for the food charity Gefiltefest that I am involved with. I opted to use their logo, the aubergine, for the sculpture. It is true to size, as big as a healthy, voluptuous aubergine. This is solid Valrhona chocolate, almost 3kg of it, coaxed by hand into that lovely curvy shape aubergines have. The finishing touches are the charity logo piped in white chocolate, a chocolate base for the aubergine to rest on, and strokes of green and purple painted on with cocoa butter for a more realistic veggie look. Many thanks for the truly astonishing chocolate aubergine – it is a work of art that will be eagerly devoured (though it seems a shame to eat it rather than embalm it)! 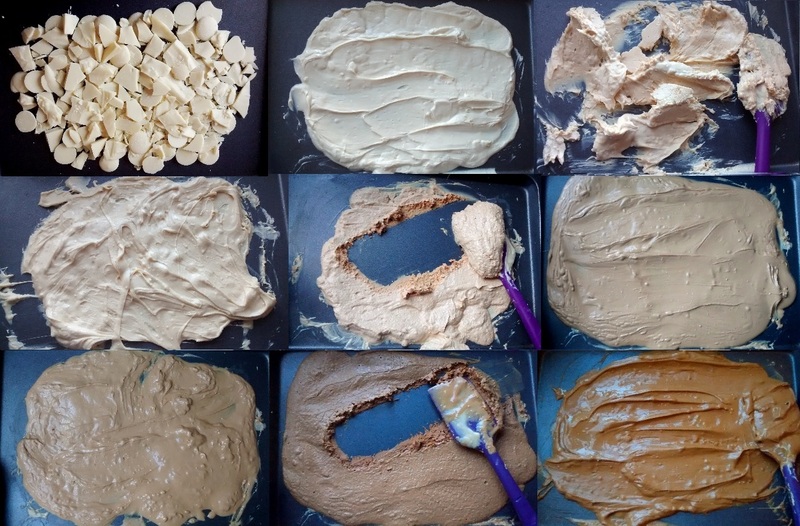 If you would like to chat to us about commissioning a chocolate sculpture, please get in touch. When we reached our second birthday, I decided it was about time for Kokopelli’s to test out the realm of food awards, and start entering a couple of products for accolades. Last week we found out that we have won a Great Taste Gold Star Award for our Fresh Lime Chocolates, for which I am absolutely delighted! 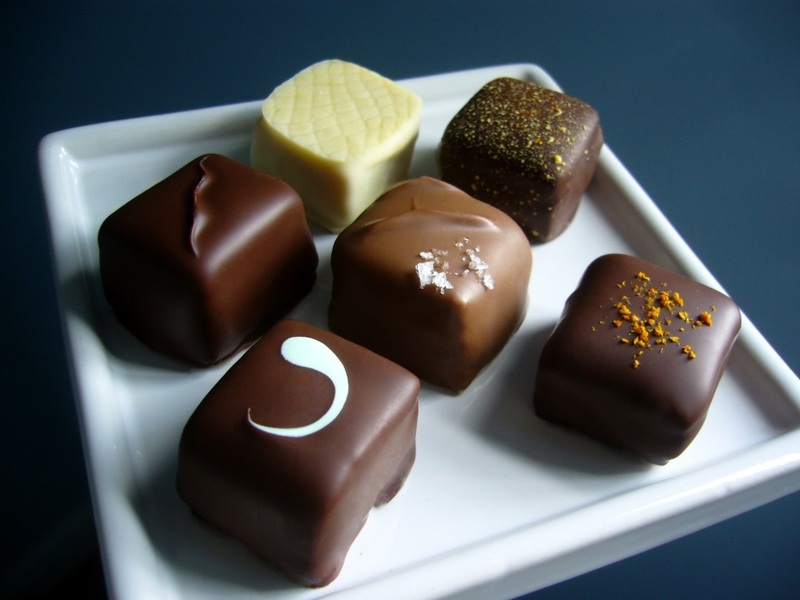 Beautiful little chocolates with a delightfully delicate design. Super texture – smooth and rich. 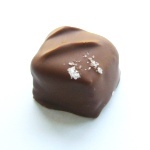 The thin crisp shell enrobes a delicious velvety ganache. The flavour is well balanced and the lime releases as the flavour unravels. A nice refreshing chocolate. Well made and the lime flavour is lovely. The Great Taste Awards are organised by the Guild of Fine Food, and are the acknowledged benchmark for speciality food and drink. 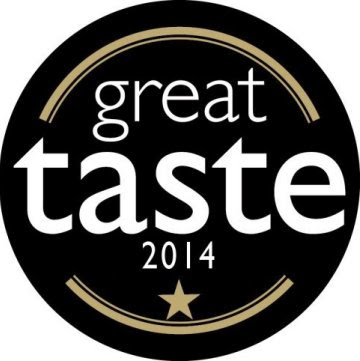 Great Taste has been described as the ‘Oscars’ of the food world and the ‘epicurean equivalent of the Booker prize’. Well, we are feeling rather pleased with ourselves. Lavender reminds me of childhood holidays over the border in France, where it is abundant in the summer and gorgeously fragrant. 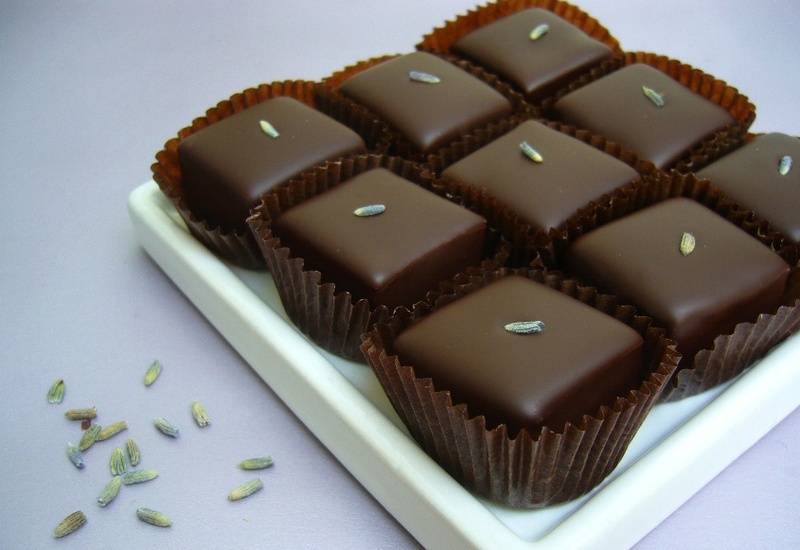 Here, we are evoking that lovely essence with a lightly lavender-infused dark chocolate ganache, decorated with a delicate little lavender bud. 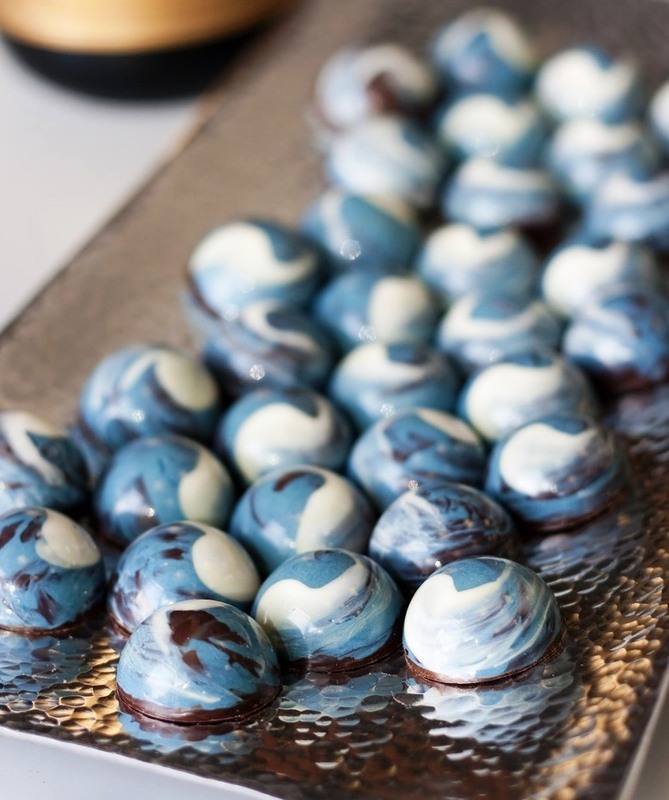 These chocolates are made with a white chocolate ganache infused with dried elderflowers, which give a different aroma to fresh ones. It’s a bit stronger and more intense – less sweet. 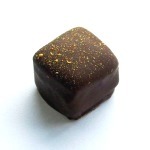 These chocolates make me think of lazy summer afternoons in the sun, just soaking up those golden rays. 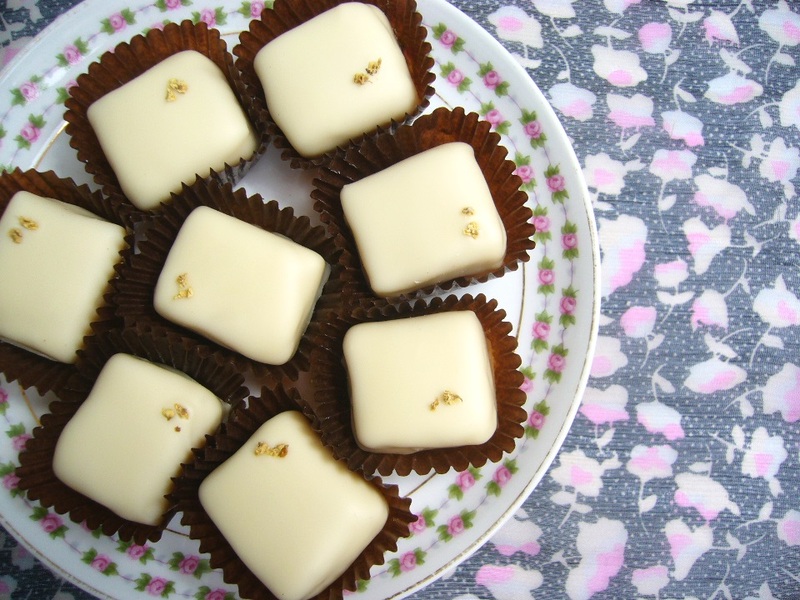 To keep that delicate flower fragrance at the fore, these ganaches are enrobed in white chocolate and decorated with a little of the dried flowers they are infused with. Both these delights can be found for a limited time only in our Summer Chocolates box, alongside a beautifully fresh raspberry pate de fruit (vegetarian real fruit jelly). 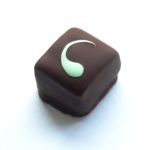 It’s been a rapid two years since I launched Kokopelli’s Chocolate. The time has flown – it seems not so long ago we celebrated our 1st birthday. It’s been a busy second year. We have run more than 40 chocolate-making and tasting workshops this year, most of which have been private parties for children’s birthdays, hen parties, corporate team-building events, one-to-one tuition, and ‘just because’. We have worked with other organisations to teach public classes too, including The Make Lounge (sadly now closed), Mrs Moore’s Makes and Bakes, I Made It Myself, LJCC, JW3 and others. We have run hands-on demonstrations at Gefiltefest and for many hundreds (!) at the breathtaking BAPS Shri Swaminarayan Mandir, Neasden, and we have worked with West Hampstead Community Centre to put on free chocolate workshops at Halloween and Easter for local children. 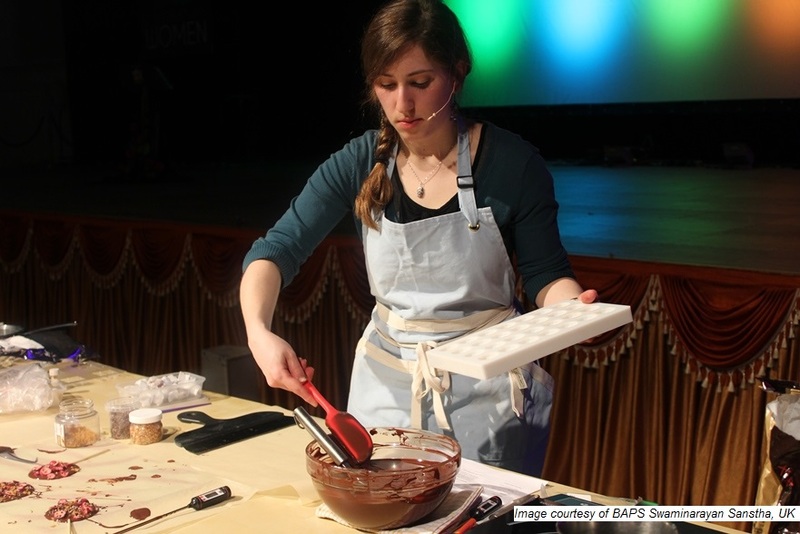 We have even gone into primary schools to run chocolate workshops in their classrooms. As well as these regular events, we ran a wildly successful Edible Cinema event in partnership with JW3, where we screened a cute, romantic French film set in a chocolate factory and created a range of chocolates and other sensory experiences for the audience to mirror what was happening onscreen. We had lemon chocolates, pink peppercorn bark, green tea chocolate, a melt-in-the-mouth ganache, paprika ganache, a sweet-smelling rose for everyone, indoor rain and much more… It sold out in double-time. 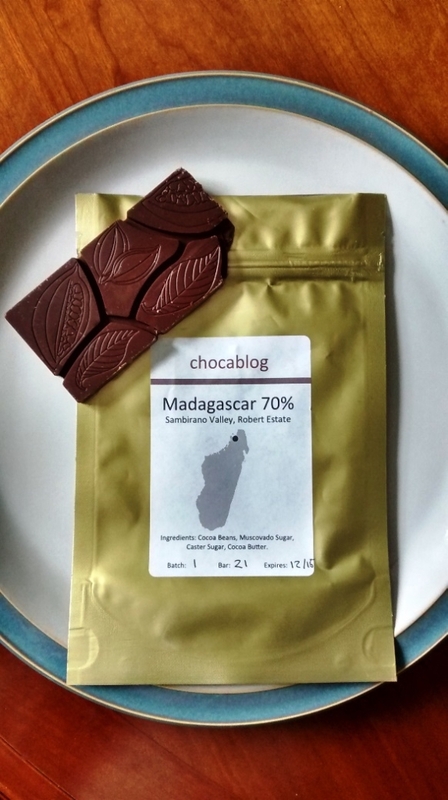 We have continued to sell our treats online, to local shops, and at a range of markets, including The Chocolate Festival, as well as in smart City offices, and smaller events such as the launch of a book about the history of chocolate. 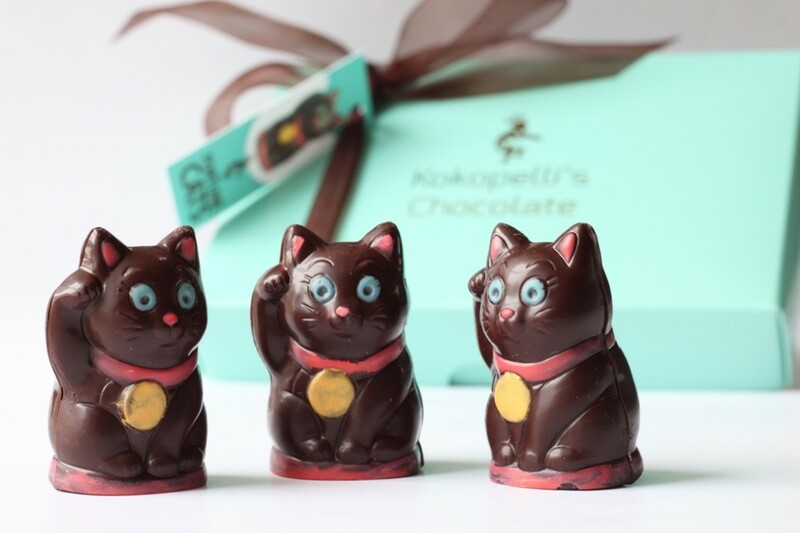 A clutch of new products made their way into the online shop over the year in the form of our Matcha Bar, Chocolate Gingers, Passionfruit Caramels, Fudgy Bites, Chocolate Lollipops and last but definitely not least, our beloved Fortune-Telling Cats which fly out of the shop like buttered hotcakes. Holidays and events throughout the year have given us the excuse to dream up limited edition chocolates for you, bringing you new delights such as Hallowe’en spiderwebs, autumnal Pumpkin Spice chocolates, the Mandarin Pate de Fruit and Nutmeg Caramel at Christmas, the Valentine’s Caramel Collection, and Easter goodies including Chickens, Eggs, ‘Fried Eggs’ and Rocher Nests. It’s always a pleasure to receive requests for something unusual or bespoke – we love a challenge! We’ve enjoyed providing custom chocolates for both companies and individuals, from cute birthday wishes in chocolate, to personalised chocolates with the lucky recipients’ names, to wedding favours, large Christmas orders and special chocolates for corporate events. Probably the best special request this year was the set of bespoke wedding cake decorations I made from chocolate. Oh yes, those were fabulous and I enjoyed every second of creating them, right through to the satisfaction of hand-delivering them all neatly packaged. To top it all off, we’ve had some more stellar reviews of our chocolates and a lot of lovely messages from loyal customers and people trying our treats for the first time. Thank you so much to all of Kokopelli’s customers for making this such a great year for us. I’m excited for the year ahead… bring it on! Chickens, eggs and nests – must be Easter! I think Spring is my favourite time of year. It’s full of a welcome warmth, sunshine and pretty new things like flowers. And fresh chocolates. We’ve been busy here dreaming up new confections for you to celebrate Spring and Easter this year. The Easter Collection is available from our online shop now – and very much limited edition, so place your order soon! 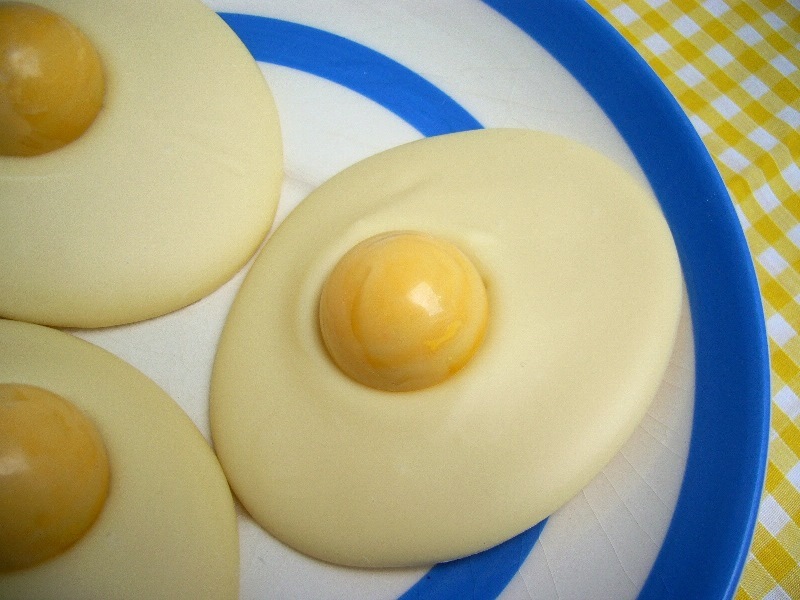 We have gone all out and also made some ‘fried eggs’ for those with a sweet tooth – the yolk is filled with a lemon fondant. Also available on the shop here. 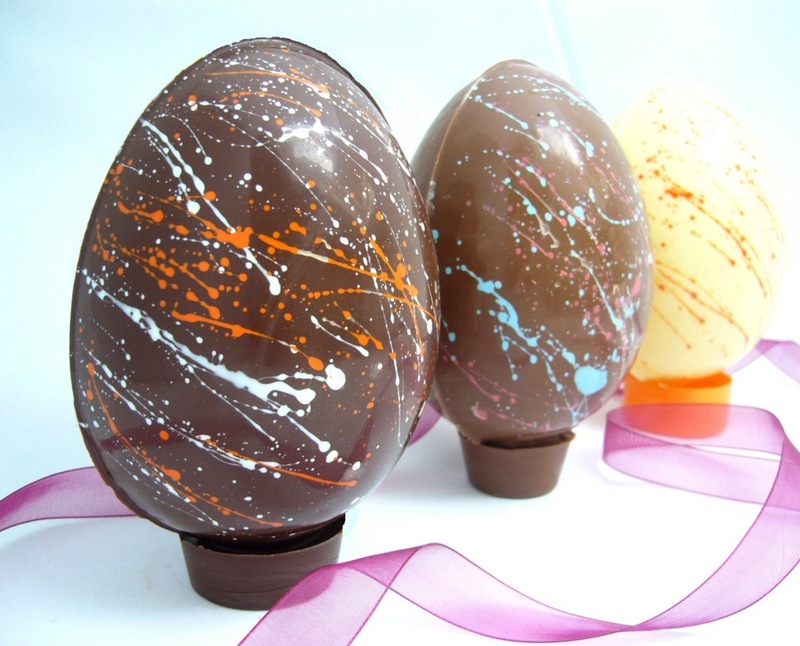 And finally, we’re doing Easter eggs again this year, in dark, milk and white chocolate, all hand-decorated with splashes of coloured cocoa butter. These eggs are available for collection only (please get in touch to arrange).